Ronald Reagan and golden retriever dog Victory at the ranch, 1984. For Ronald Reagan, a former actor turned governor who was running for the nation’s highest office in 1980, Victory truly would be his. Victory the puppy, that is. A nurse from Milwaukee named Carol Schaidler, who once worked for Nancy Reagan’s father, presented Ronald Reagan with a 5-week-old golden retriever puppy named Victory during a stop on the campaign trail on March 26, 1980. The Associated Press published this adorable photo. Schaidler promised to care for the puppy until Reagan entered the White House. But first, of course, Reagan had to win the election — which he did resoundingly in November 1980. Unfortunately for Victory the dog, though, a big move to Washington just wasn’t in the cards. The Reagans opted to leave him and several other dogs behind at their ranch, Rancho del Cielo, in California, where the dogs had free run of the property and plenty of sunshine to bask in. President Reagan and Victory often did ranch work together. The sweet-faced dog was said to be gentle, friendly, and loyal. By all accounts, he was a great companion and was always very excited to see the president return to the ranch on vacations. 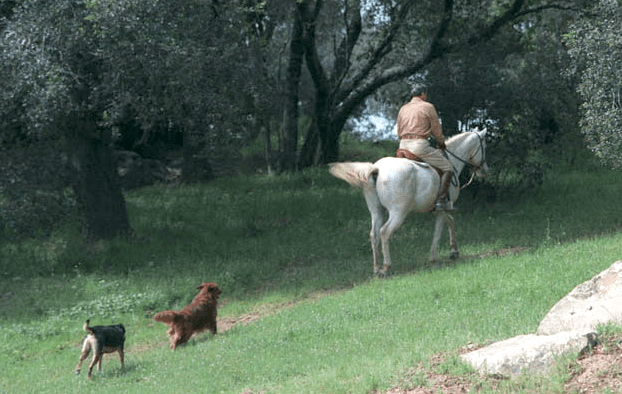 President Reagan horseback riding at Rancho del Cielo with Freebo (his daughter’s dog) and Victory the golden retriever following. April 4, 1986 photo courtesy Ronald Reagan Presidential Library and Museum. Here’s a side story that’s not widely known these days. On the morning of July 19, 1980, not long after selecting George H.W. Bush as his running mate, Ronald Reagan presented Bush with a golden retriever puppy named Veep that was from the same litter as Victory’s. 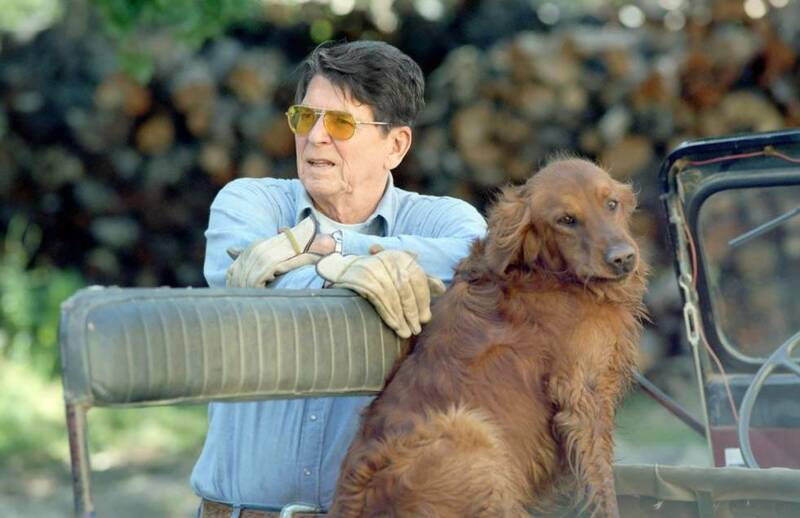 “We’re now canine relatives,” Reagan said. Unfortunately, the Presidential Pet Museum has not been able to find any more information about Vice President Bush’s golden retriever. What happened to Veep? We just don’t know. We contacted the George Bush Presidential Library, who said they have no records of that dog. 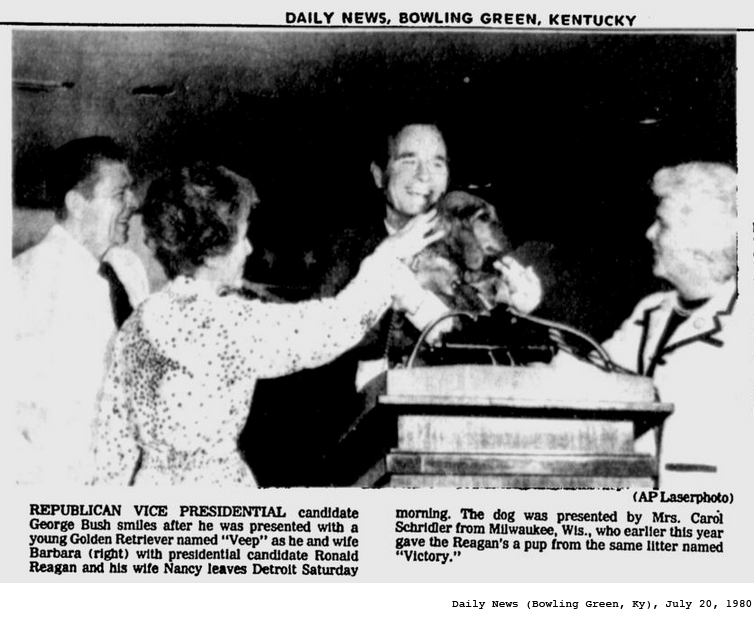 In 1985, the Bushes got an English springer spaniel named Millie, who would go on to become one of the most famous presidential pets in recent memory. Millie then became mom to Spot, one of George W. Bush’s dogs.